Mini kegerators are beer-dispensing systems that work with smaller kegs. It is a more affordable way to enjoy a tap-quality beer at home without the expense of a full-size kegerator and the larger kegs. Many beer manufacturers produce 5-liter mini kegs that will offer beer lovers their favorite brews without a bottle or a can. Designed by those who love draft beer, you won’t need a home bar with this product option. Most will sit on a countertop and will keep your beer at your preferred temperature. That allows for many beers to stay fresh for up to 8 weeks after purchasing the keg. Mini kegerators are a special type of product. They’re not quite an appliance, but more advanced than a coffee maker or similar countertop option. If you haven’t experienced the joys of owning one yet, then these are the top-rated options you’ll want to consider. Like their larger counterparts, a mini kegerator is easy to setup, can dispense fresh beer on demand, and have the versatility to be installed in various locations, from the man cave to the garage. 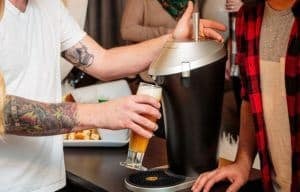 What Is a Mini Kegerator and Why Do I Need One? A kegerator is an appliance that is used to keep a keg of beer, of varying size, at its proper storage temperature. The kegerator gives you a tower that allows you to tap into the keg and dispense draft beer at your leisure. It’s like having your own bar, at home, without the hassle or cost of installing an actual bar. The mini kegerator is just a smaller and more portable version of this appliance. Instead of working with half-barrels or Corny kegs, it works with a standard mini keg, which is typically 5 liters in size. What is different about a mini compared to its larger cousins is that certain models require certain types of kegs to work properly. Some models work with a pressurized keg and are designed to be a top-dispensing draft model. Others are designed to work with gravity-based kegs where the beer flows from the bottom to the top. A few models can accommodate both options. You’ll also find that some require you to use a non-pressurized keg and have a CO2 release every time you use the tap. Whatever the case may be, the mini kegerator can help you enjoy fresh draft beer, at home, for a minimal expense. It’s the perfect size for those who love to drink draft beer, but without the threat of waste that might come with a full-size model. Think about it like this: if you like to have a draft beer 1-2 times per week, then a miniature design is a wonderful option. 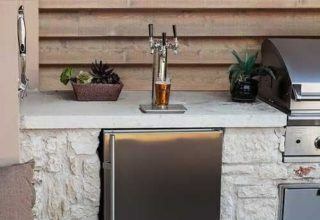 If you prefer to have 1-2 draft beers per day, then one of the best outdoor kegerators or a full-size indoor unit is going to be a better option. What Beer Is Available in a Mini Keg? You’ll find that mini kegs while growing in popularity, are not always available in some communities. When they are available, it is common to have only a handful of different beers available for purchase. One of the first brands to embrace the concept of the 5L keg was Heineken. Their mini kegs are easy to spot when shopping with its green lid and large branding on the side. 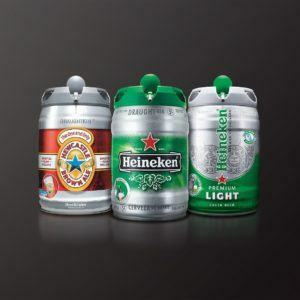 You can even purchase specific units that are produced by Heineken to distribute draft beer from their keg if you wish. Here are some of the other top beers that are currently available for purchase in mini keg form, though availability may be limited for some. Bitburger: This light pilsner has a lot of hop flavor to it, which is balanced by some bitters and spice. The end result is a beer that can be refreshing and quite aromatic, but it can take some beer lovers by surprise with the meatiness of its presence at first. Coors Light: This clear beer has high carbonation levels that benefit from being distributed by a tap instead of consumed from a can. The flavor is crisp and mild, with just a touch of a grain-like flavor to it. DAB: This pilsner is a solid option for those who like their beer simple, but consistently profound. It has a light body, a nice citrus aftertaste, and a robustness from the combination of hops, malt, and yeast. 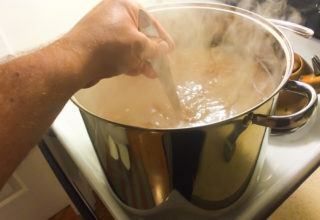 Newcastle Brown: This nutty and sweet beer is perfect for the mini keg. As it ages, the texture becomes creamier and the malt flavoring becomes more distinctive. Despite the deep flavor profile, the beer has a lighter body to it, so it doesn’t have the same bitter qualities that other darker ales and beers tend to have. Warsteiner: This is another German pilsner, but has a body that fades to the yellow end of the golden spectrum. The flavors are quite mild, with the hops definitely present, but not as overpowering as other options. What is nice about this option is that the carbonation is minimal, so it stores extremely well. Additional beer brands that may provide mini kegs include Widmer, Bell’s, and Paulaner. In addition, many local IPAs and some microbreweries offer mini kegs as well. That way you can enjoy a fantastic beer, like Spotted Cow from the New Glarus Brewing Company, in draft form. If the brewery or your local stores do not provide mini kegs, a third option is to speak with your local or regional distributor. Most distributors will require at least two business days of lead time to make a mini keg be available for purchase. With this option, you’re going to be purchasing the beer, but renting the keg. Expect a security deposit of at least $50 to be required from a distributor in addition to the price of your preferred beer. The advantage of having a distributor be able to provide you with a mini keg is that you could potentially have it filled with any beer that they are authorized to distribute. You may also find some suppliers and distributors provide special order kegs that may work with your new mini kegerator as well. What Are the Advantages of a Mini Kegerator? The main advantage that comes with owning a small kegerator is that you can use it virtually anywhere. Set it on the counter in your kitchen. Take it with you in your RV as you head out on an adventure. Take it out on your boat (and make sure you have a designated driver). Bring it to your buddy’s barbecue. Install it in your camper. The options are virtually endless. It is perfect for a tailgate party at home or at the stadium. 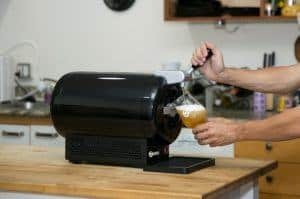 The best mini kegerators will include a pressure gauge and a CO2 regulator so that your draft beer can be presented in the best possible condition, every single time. Look for models that offer pressure controls for your CO2 for the best possible result. Some models offer thermoelectric cooling, LED temperature displays, and adjustable temperature settings. Many units also come with a cleaning kit and are designed to allow the keg to sit within a self-contained cabinet unit. Then there’s the noise that is produced by a mini kegerator. There’s virtually none. Almost every model is ultra-quiet, which means you won’t be disturbing anyone when you’re pulling down a draft. Sizing is also an option. Most models are designed to handle a 5L keg, but there are some models that will work with the brand-new 2.5L Corny kegs that are being produced in the APAC region right now. This smaller option provides you with a unique opportunity because there are coffee kegs at the 2.5L size that can work in some of these portable units. Fill yourself up with coffee in the morning. Swap it out, clean it up, and then fill yourself up with beer in the evening. That is the best of both worlds right there. Another option from EdgeStar allows you to switch between beer kegs and soda kegs so your mini kegerator can be an investment that the whole family can enjoy. A mini kegerator is one of the best value purchases available in our industry today. You can purchase a feature-rich model for around $300 and use it almost anywhere. On the other end of the pricing spectrum, you’ll find entry-level models are often available for less than $100. Many entry-level models come with the option to purchase an accessories kit for $50-$75 that can expand the usefulness of your product. Most homes will benefit from a model that is in the $150 range. At this price point, you’ll receive drip trays, cleaning kits, keg adapters, and other common features so you can maximize your beer enjoyment. This mini kegerator is also a portable draft system. Think of it as the product that would come forth if a growler and a kegerator were to get together. This model holds up to 8 pints of your favorite beer and distributes it through a stainless-steel CO2 tap system. If beer isn’t what you fancy at the moment, you can fill it with your favorite beverage instead. Kombucha is a fantastic option, as is iced tea, or your favorite homebrew. If you love a draft-style beverage at home, then you’re going to want this model. This portable beer system is an excellent option for those who like to have a good beer with a great head. This micro-foam technology so that a draft experience comes without the need to have a full keg around. The best part about this unique product is that it works to create draft-style beer by using bottles, cans, or growlers. This model supports 64-ounce containers. Now here’s the best part: all you need to do is have 4 AA batteries around to take advantage of what this patented technology can do. This is an excellent system for those who want a homebrew setup at home to distribute draft-style beer. 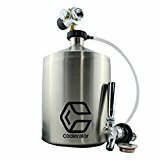 This setup comes with a 64-ounce stainless-steel keg dispenser, a miniaturized CO2 regulator, and a beer dispenser. It works with multiple types of beverages and is ultra-portable, allowing you to take it anywhere to have your favorite beverages. One note of which to be aware: the CO2 cartridge that is required for the carbonation system must be purchased separately. This is the mini kegerator you’ll want if you like Newcastle Brown Ale or Heineken beer. It is designed to exclusively work with the kegs produced with these beers and will keep them at the precise 37.4F ideal temperature. It features a Peltier cooling system which works consistently well. Beer stays fresh with this model for up to 30 days. Features include a drip tray, 5 draft tubes, and an LED temperature indicator. It won’t with other mini kegs, so be sure you’re invested into Heineken or Newcastle before purchase. 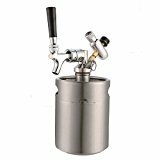 What we liked about this little pressurized system is that it provides you with the benefits of a mini kegerator while still offering the benefits of a growler. 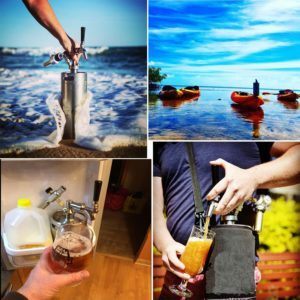 It holds up to 64 ounces of your favorite beer, including craft beer or homebrew, so it can be shared in a portable way. It’s also an easy way to carry your favorite beer back from the pub or bar. The stainless-steel bottle is vacuum-insulated to ensure temperature and freshness remain consistent. It isn’t a long-term solution for great draft beer, but it does get the job done. If you’re looking for a good draft beer solution, but you don’t drink a lot of beer, then consider this option. It holds one full mini keg and operates within a container that is similar to a cooler. You can take it anywhere and enjoy the benefits of this pressurized system. It does require threaded CO2 cartridges which are not included. Your beer can stay fresh in this unit for up to 30 days and there are 2-tap systems available as well – hard to find when shopping for a mini kegerator. Pound for pound, this may be the best product in the category. 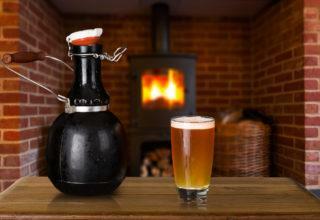 If you like the idea of a growler, but 64 ounces is too small, then this is the product for you. If you like the idea of a mini kegerator, but 5 liters of beer seems like too much, then this is the product for you. At 128 ounces, it can hold plenty of your favorite homebrew, craft brew, or microbrew. It will also hold tea, coffee, or whatever else you want in its pressurized system. Thanks to the design of the automatic regulator cap, it will maintain a perfect level of carbonation in your beverage for all day satisfaction. Invest into this wonderful invention and we think you’ll be just as pleased as we were. This mini kegerator with dispenser is one of the few that accepts a Heineken 5L keg and a standard 5L keg. It is also one of the few that comes with the CO2 cartridges it needs in the box. Fueled by thermoelectric cooling technology, you’re able to store and pour your beer for more than a month and still have it be fresh. We liked the stainless-steel housing and ease of the pull tap. The CO2 controls can be a bit touchy and take some practice to get used to using, so we’d recommend trying it on a beer that isn’t your favorite first to get to know this system. 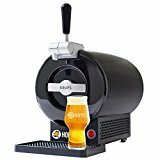 This beer dispenser, designed by Krups, is a way to enjoy craft beer that comes fresh from the brewery. It is only available for delivery in limited areas, so make sure your address qualifies before ordering. We like that it fits nicely onto any standard kitchen countertop and it does an excellent job of keeping beer fresh. The one downside we see is with the plastic 2L bottles it must use. Prolonged storage in the plastic container does change the flavor profile of most beers. For those who drink their beer quickly, we’d highly recommend this product. 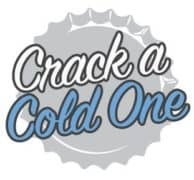 This chiller option is another great way to provide a nice draft beer at any party or when you get the urge to crack a cold one open. It cools any beer stored within it to 3C lower than what the ambient temperature happens to be. Because of that feature, using it in hot weather is not recommended. It uses standard 5L kegs but requires the gravity-style dispersal method with the tap on the bottom to work properly. We do love how it is highly portable and provides a consistent delivery. For cooler places, this is a must-have item. The best mini kegerators will give you the chance to enjoy a draft-style beer without a major investment. Choose the option that works best for you, make the investment, and enjoy a great beer. You’ve earned it.